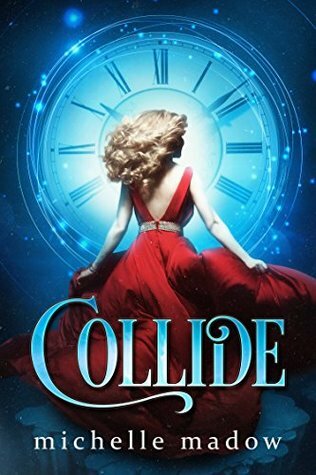 I’ve read groundhog day-esque books before but there is something unique about Collide. It has an element of murder mystery, as Anna tries to figure out who shot her at the dance. Also the characters are much more aware than you normally see. Anna is brave, strong and dedicated to her studies. She desperately loves her best friend turned boyfriend Jake and is still haunted by her mother's death. When she is tossed into an alternate universe of her life where her mother is still alive. It throws her off kilter. The person Anna is today was greatly influenced by her mother’s death and now she is seeing what her life would have been like had it not happened. Annabelle is more carefree and finds happiness in different things and different friends. I hate to say it but I liked Eric more than I liked Jake.I’m like stop chasing the boyfriend from the other universe!! Eric is great! He was so supportive of Annabelle through the whole thing from the minute when she told him what had happened. He is also more trustworthy and more willing to fight for her. I just felt like Jake might have been great in Anna’s world but in Annabelle’s, he seemed kind of like a dud. Ugh I just didn’t like him. I loved how Anna is able to explore why her friendships fell apart in her world and why others stayed together. The differences between Claire and Marissa are obvious. I just thought that part was really interesting. The book is fast paced. I read it in a day because I felt like how could you not. I needed to know what was going to happen! Plus that ending. Whhaaaattt! I’m still reeling. I really enjoyed the story though.